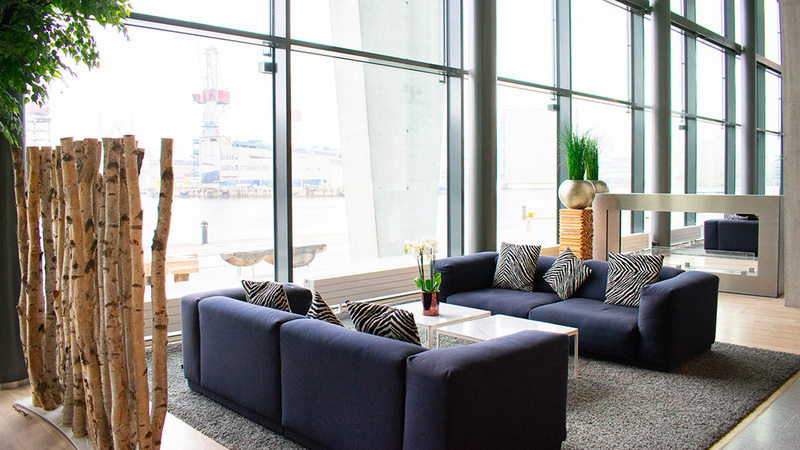 Touching the seaside coast of the new Jätkänsaari district in the Western Harbour area, Clarion Hotel Helsinki is a high-toned meeting place with views from up to 16 floors high. 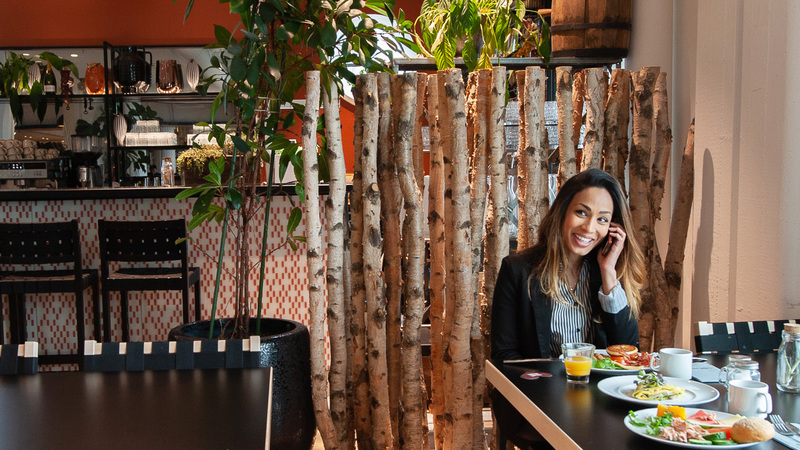 Just a few minutes from the city center, the Clarion Hotel Helsinki offers stylish quality accommodations perfect for city breaks and convenient for business trips. Exhausted after the long travel, I was looking forward to staying the night at this hotel that had been recommended to me by one of the local parties I came to the city to have a meeting with. 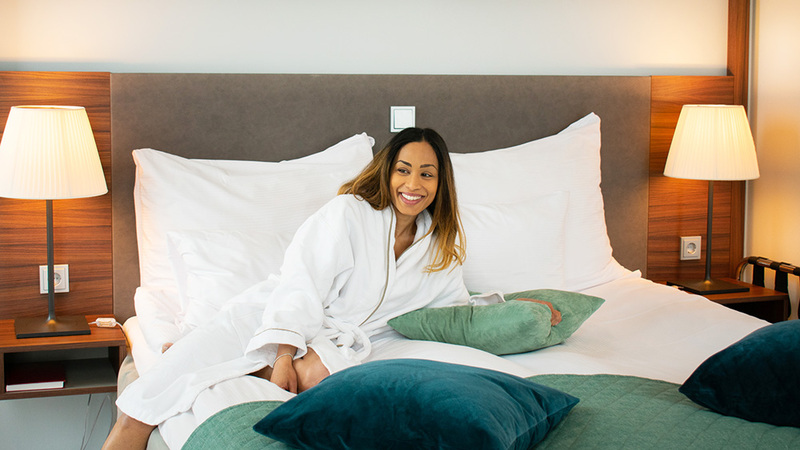 My first impression of the hotel was: “I could live here.” It had a professional yet homey feeling and walking into the lobby was as if I was coming home to the stylish living room – I someday dream of having. I was impressed with the place and excited to settle in for the night before my big day ahead. After unpacking, I went to look for the gym to do a short 20 minute workout, when I was pleasantly surprised to discover a stunning rooftop pool that I could have never imagined was hidden there. After my workout I had a dip in the pool, and the views of the city from the sky were a postcard sight to send home to my loved ones. 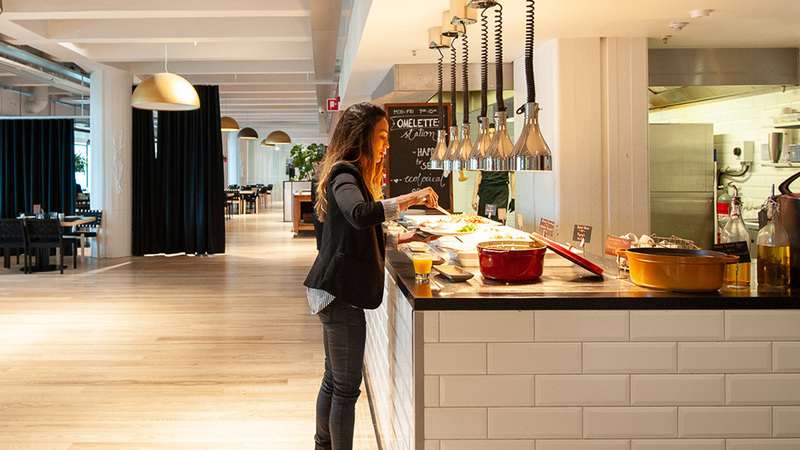 I saw that there were also saunas near the gym, a choice of 425 rooms and suites, the Sky Room bar and lounge, a modern conference centre for up to 1,000 people, and the Kitchen & Table concept restaurant by Marcus Samuelsson. 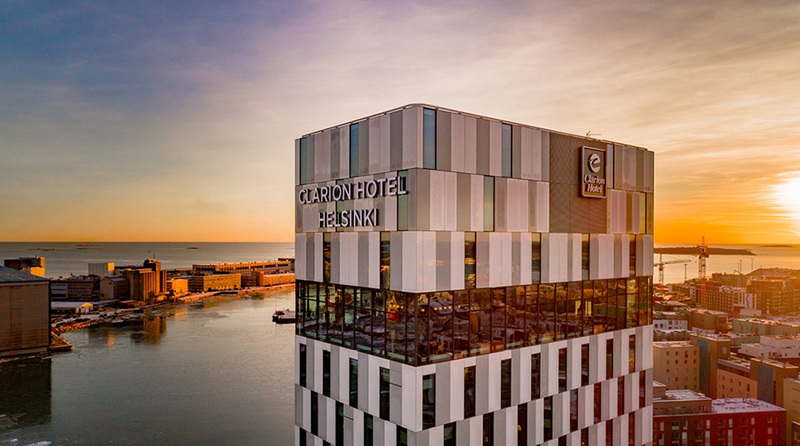 At 78m high, there is no doubt that the Clarion Hotel Helsinki stands out from the crowd! The two window-clad towers that form the hotel are linked by a transparent glass footbridge, with clear elevators that in most places of the world, would have lines of tourists waiting to buy a viewer’s ticket up. Here, at Clarion Hotel Helsinki, it was just another breathtaking trip on the way to my bedroom. 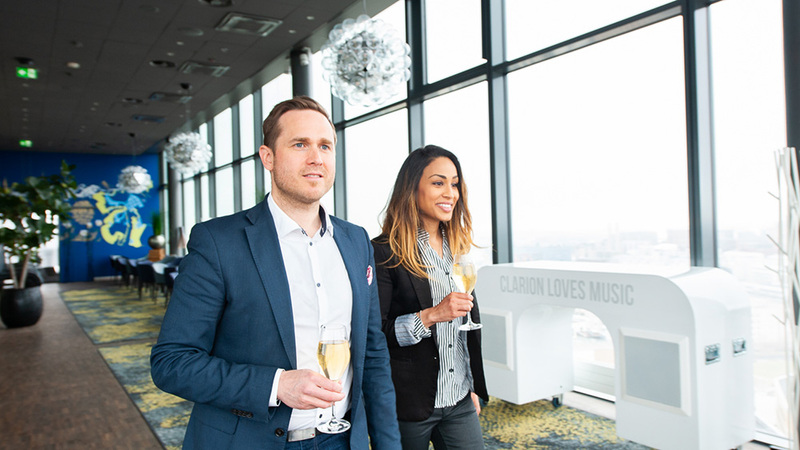 There’s a vantage point from the highest roof where visitors can gaze out over Helsinki, and a far more comfortable view that can be seen from the trendy Sky Room bar and lounge. Guests can expect comfort and excellent décor in the hotel’s thoughtfully designed rooms and suites. Using the finest in contemporary design and luxuriant colours, different themes have been created for the rooms, with several wonderful suites for those seeking a unique hotel experience. I saw an interesting or intriguing piece of furnishing no matter where in the room I looked, from the strategically cracked and stained glass mirror, to the metal wine rack perfectly fitted into an ordinary-looking side table. It seemed that every item had its own story to tell. I took pictures of several bits and the room at large, to add to my design inspiration folder with ideas for my own home. The six suites are located on the top floors of both towers, with views that make you want to stay in bed and stare out all day. The essentials of gym and refreshing swim out of the way, I was ready for my friend who was coming to meet me at the Sky Room. Sky Room Bar & Lounge – Views to Live For! 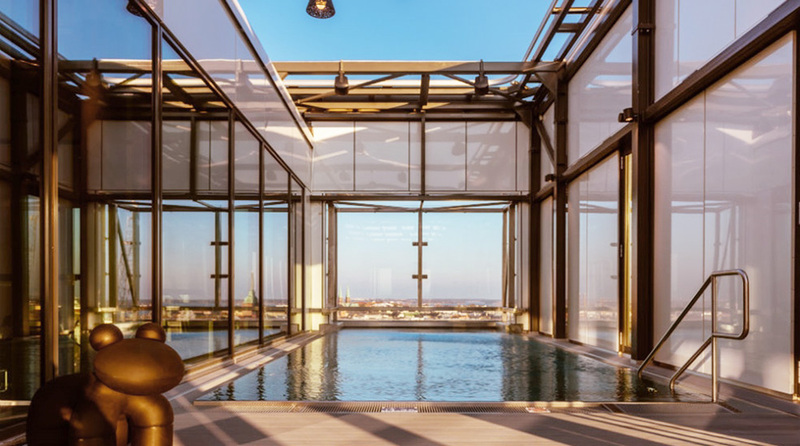 Not only do 16 floors of hotel give many options of modish rooms, the Clarion Hotel Helsinki is also one of the greatest places to relax, unwind, reflect and take in the views – thanks to the impressive Sky Room. A secret treasure of a place hidden among the cloudy sky, the room has a calming serene feel, and as such a corner by the window is best enjoyed with a friend and a delightful drink or a few. We were at the top of one of Helsinki’s tallest buildings when a friend of my friend called to ask where we were. Soon our table of two grew to a group of new smiling faces and the air was filled with laughter and light-hearted conversation. Everyone marveled in wonder at the magic of the Finnish summer’s bright misty skies and the landscape of city buildings peeking out in the distance. “Sky Room. This is my kind of nature.” I thought. 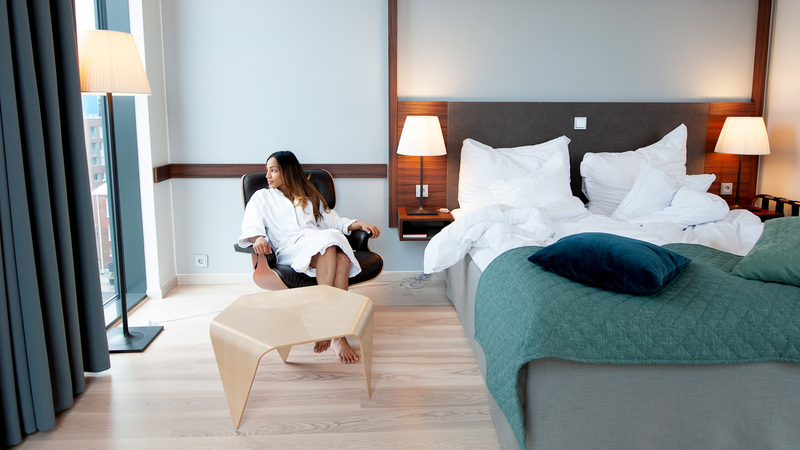 Guests will discover the luxurious and classy Sky Room, commanding spectacular views over the city to be tastefully decorated in Nordic chic, with artwork by both young Finnish and international artists. 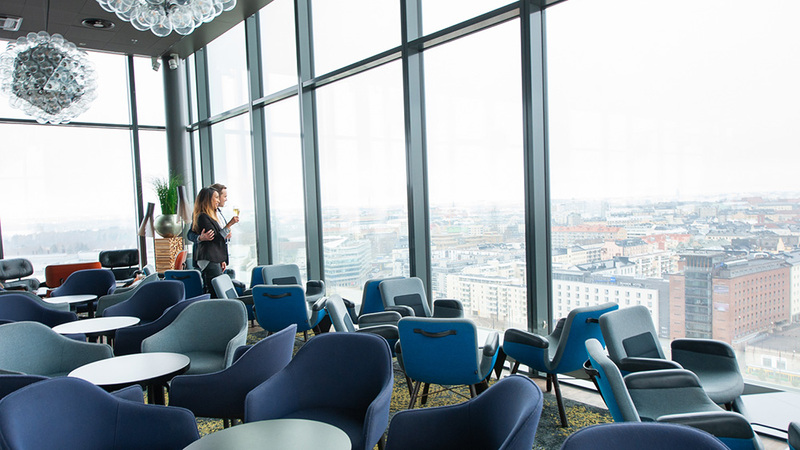 The Sky Room is one of the coolest meeting points in Helsinki and is sure to impress. 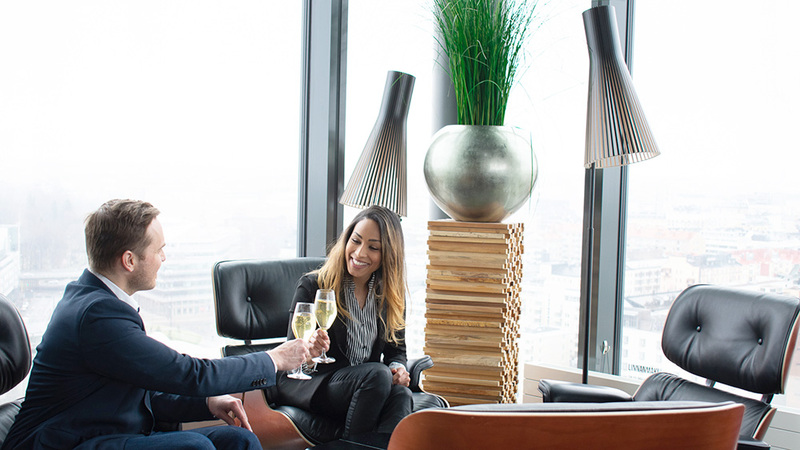 Make yourself comfortable, relax and take in the view, while enjoying drinks created by experienced bartenders, or perhaps something from their range of fun and surprising snacks! As my evening festivities went on a bit later than they probably should have, a good hotel breakfast was essential to give me the energy I needed for my important presentation the next morning. I grabbed a plate from the buffet and was happy to find a freshly blended mango smoothie, one of my all-time favorites. Still not fully awake, whilst I passed by the open kitchen, I was greeted with a happy cook who called to me: “May I help you Ma’am? How about a hot omelette?” How could I say no, a healthy protein breakfast was definitely the way to go for the winning streak I wished to have in my meetings that day, so I chose to fill my omelette with all the toppings available, and it was delivered to my table with a smile and even a curtsy. There were all of the elements one hopes to find in a hotel breakfast, including the delicious cappuccino that was offered to me at the bar and delivered promptly to my table. Since for many business travelers like myself, much of life can be spent with hotel staff instead of family, it meant a lot to me that the Clarion staff were warm and friendly and I quickly forgot the stress of my day with their welcoming disposition. By the end of my breakfast banqueting, I was ready to take on the world. 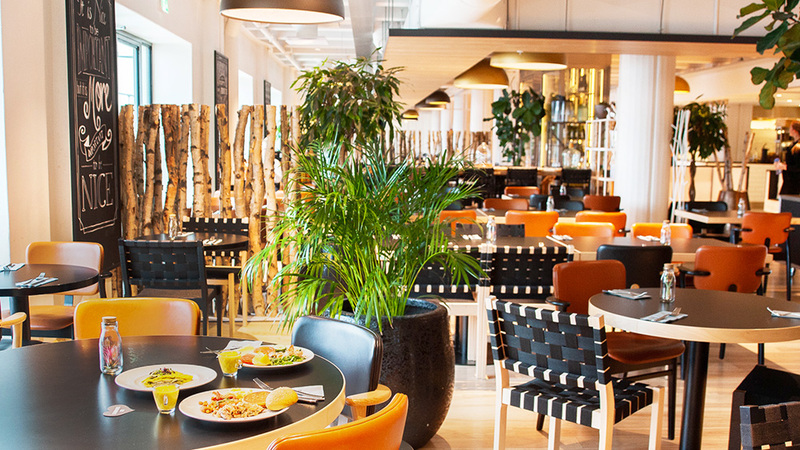 Clarion Hotel Helsinki is also home to the Kitchen & Table concept restaurant by Marcus Samuelsson, that combines traditional Finnish ingredients and local traditions with Manhattan flavours – fun dining that focuses on social eating, an open kitchen and an urban atmosphere. 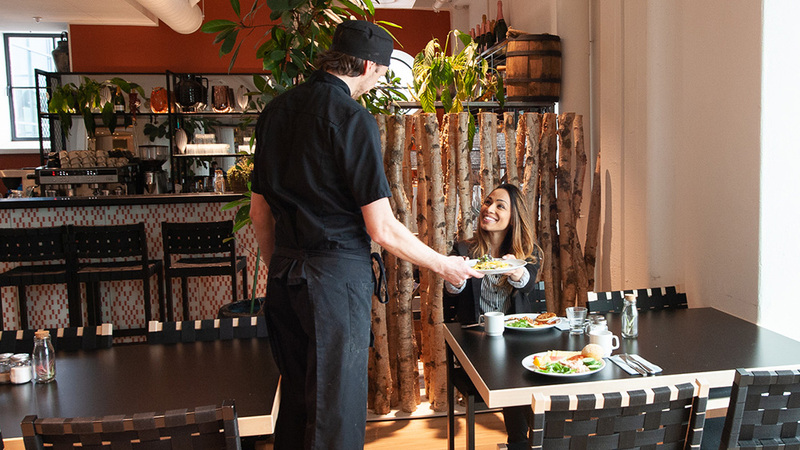 Located in the remodeled red-brick warehouse, Kitchen & Table take ingredients that are refined and combined in a tantalizing fusion, with the multicultural flavours brought by Marcus from Manhattan. The acclaimed chef behind the Kitchen & Table concept, Marcus Samuelsson has has won multiple Awards. A committed philanthropist; and a New York Times-bestselling author, he planned and executed the Obama Administration’s first state dinner, and cooked with Michelle Obama on TV! Having stayed at most of the hotels in central Helsinki, this is definitely my first choice for a short break and/or business trip – an affordable option for excellent service and modern comforts, It was an absolute delight to spend the night and I promised the staff at the reception that I would be back soon, since by the time I checked out, I felt convinced that my refreshing stay at Clarion Hotel Helsinki had most certainly contributed to the great success I enjoyed in my business dealings during this whirlwind trip. No doubt a result of good night’s sleep and having everything I needed. If things went as planned with the work deal, it was a matter of weeks before I would be back, and I was happy to know there was a place I could feel at home, nestled in the skies.